If you’ve been reading a lot about sheet masks, you may have come across the admonition not to expect anything from them in terms of real skin improvements. The common knowledge is that sheet masks are pretty much only good for a temporary boost that will fade within a couple of days at the outside. And while that’s definitely true if you only use a sheet mask occasionally, I’ve always wondered if the conventional wisdom still holds if you, like me, use a sheet mask every night and have an enormous and diverse stash of both standard and higher-quality masks to choose from. Last night, I planned out an experiment to find out exactly that. Hypothesis: Consistent daily use of sheet masks carefully selected to target a specific skin issue can produce real results. Reasoning: Sheet masks really are a more intensive treatment than regular serums and essences. The essences are able to penetrate the skin in larger quantities and for much, much longer periods of time than everyday products can, due to the mask sheets preventing evaporation. In addition, the penetration enhancers (most commonly, glycols like butylene glycol, and often alcohol as well) in sheet mask essences also, uh, enhance penetration. Combining the intensiveness of the treatments with regular and consistent use and proven ingredients should therefore result in results comparable to those produced by everyday products like serums and creams, but at an accelerated rate. Method: I will choose seven sheet masks that all contain the same proven ingredients that target a specific skin issue. This week, I’ll be focusing on whitening masks. 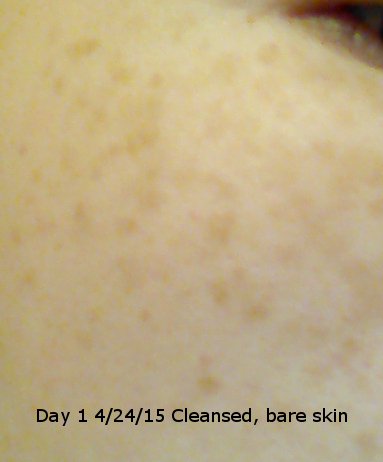 While my freckles (sunspots) have faded significantly in the year and a few months that I’ve been on an effective Asian skincare regimen, I started out with a lot, and I still have some very persistent ones that don’t want to budge. You can tell they’re from sun exposure because they’re across my cheekbones at the highest points, exactly where the sun would hit. Crappy bathroom lighting brings them out even more, as you can see below. Upsettingly close-up before picture. I took this picture immediately after my nighttime cleanse last night, before I even put my A-Sol on my face. I’d like to see if a really targeted approach to sheet masks can make a difference in these things. This is the chosen lineup. I’ll be taking progress pics every day and posting reviews along the way. In seven days, we’ll know whether my hypothesis has any merit. How often do you use sheet masks? thanks for sharing 🙂 I loved to read your post! Great idea for an experiment! Could I suggest that you include links to the results of this experiment at the bottom of this post? I had to dig around to find the “conclusion” post (good thing it’s the weekend). Almost thought there wasn’t a conclusion but I was like “surely not? She’s a very thorough blogger!” Sure enough you’d written one! Ayyy, thanks for pointing that out 😀 Yeah, I’ll link that! Yes, it works! Just make sure the masks have proven lightening ingredients. Niacinamide, licorice root extract, tranexamic acid, arbutin, kojic acid, mulberry extract are all good. Hurray! You should totally try the Leaders Insolution Vita Bright sheet mask and the Mediheal I.P.I ampoule sheet mask, I’ve used them and actually like it. Though currently nothing beats MBD aloe – super soothing, hydrating and doesn’t dry out for a long time. Love feeling all marinated in that delightful aloe essence!